Spoiler Alert: the Nikon AF-S DX 35mm F1.8G is a real gem and a lens that I recommend to just about every Nikon APS-C (DX) DSLR owner. 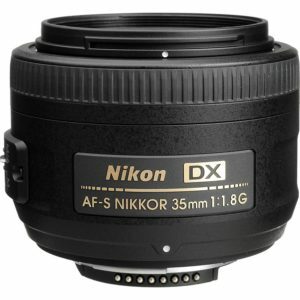 If you own a Nikon APS-C (DX) Digital SLR camera, you should definitely look into buying this lens. The lens features a near normal perspective with a fast f/1.8 aperture for low light or shallow depth of field applications. When photographers start to take their craft seriously the Nikon AF-S DX 35mm F1.8G gives you a lot more flexibility for creative photography. One area where cell phones can’t match a DSLR is in shallow depth of field (although they are doing software simulations that come close). The other is in low light photography where the larger sensor of the DSLR is more efficient at gathering light. The Nikon AF-S DX 35mm F1.8G furthers the low light advantage with it’s fast f/1.8 aperture that allows significantly more light in than the kit lens that came with your camera. The best part is that the lens is a bargain at less than $200! It’s a shame that Canon does not make a similar lens for their APS-C bodies and a reason why I might recommend a Nikon over a Canon if someone isn’t sure which one to get. Of course Canon has some advantages as well, but the lens is one of the most important aspects of photography and this lens is extremely good! But really, this lens is one of the best lenses in terms of image quality for the price. This lens will give you a significant improvement over your kit lens that came with your camera and even rivals lenses that cost a LOT more. The f/1.8 aperture is another factor that helps to improve image quality. if you are shooting with your 18-55mm kit lens at 35mm your max aperture is around f/4. in low light this restricts the amount of light coming in to the camera. This will force you to raise your ISO to maintain a fast enough shutter speed. For example, if you are at ISO 6400 and f/4, by having f/1.8 available you can open up by 2-1/3 stops which allows you to drop your ISO to 1250 which is much cleaner and sharper. Wide open this lens does vignette just over 1 stop in the corners, but this can be fixed fairly easily as long as you are not shooting at ISO’s above 3200-6400 (depending on your camera). Adjusting this brightens your shadows, which increases noise and at higher ISO’s noise is stronger already. However, the vignetting is not bad and many photographers will add vignettes to their photos to help draw the viewer’s attention to their subject. This lens is pretty much distortion free in terms of pin cushion and barrel distortion. If you shoot a close up of a person’s face you may notice perspective distortion but this is a function of the focal length and focal distance rather than the lens itself. This is why most photographers prefer to use lenses over 50mm on APS-C (DX) cameras. The longer focal length forces the photographer to step back and this fixes the perspective in most cases. On APS-C (DX) bodies I prefer to shoot at 85mm for head shots, but for small groups the 35mm lens is great. Just be sure to stop down for depth of field. Otherwise your front and back rows may be out of focus. Lens flare is well controlled unless the sun is directly in the frame. It helps that the lens comes with a hood as well. The body is mostly plastic and not weather sealed, however, it does have a metal mount which is a welcome step up from most kit lenses. The lens does feel platicy and hollow but for $2000 I wouldn’t expect anything different. No lens is perfect, but the Nikon AF-S DX 35mm F1.8G comes darned closed. At less than $200, the image quality is excellent and the artistic flexibility is unmatched by the typical kit lens. If you shoot with a Nikon APS-C (DX) camera such as the 3000, 5000 or 7000 series of bodies and want to explore photography more then you should absolutely get this lens! based on 5766 user reviews online.